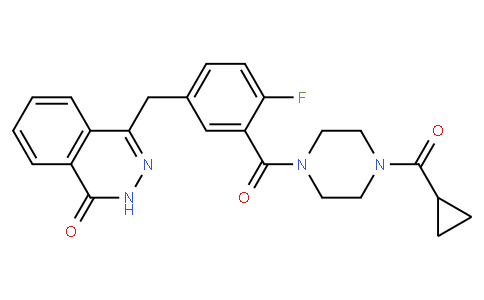 Olaparib (AZD-2281, trade name Lynparza) is an FDA-approved targeted therapy for cancer, developed by KuDOS Pharmaceuticals and later by AstraZeneca. It is a PARP inhibitor, inhibiting poly ADP ribose polymerase (PARP), an enzyme involved in DNA repair.It acts against cancers in people with hereditary BRCA1 or BRCA2 mutations, which include some ovarian, breast, and prostate cancers. In December 2014, olaparib was approved for use as a single agent by the EMA and the FDA. The FDA approval is in for germline BRCA mutated (gBRCAm) advanced ovarian cancer that has received three or more prior lines of chemotherapy.